Traditional dazzle, it brightens up any dish. A delightful medley of sweet, sour, tangy, salty, and savory. A quick and easy dipping sauce for whole grain pasta, noodles, cooked vegetables, tofu, fried food, and fish, and splendid as a salad dressing ingredient, and marinade. Poured over Eden whole grains pastas they are wonderful. No refined sugar, artificial coloring, flavorings, additives, or preservatives. Ponzu adds tons of sparkling flavor, yet zero fat as its made without oil. EDEN Ponzu Sauce is made from simply combining shoyu soy sauce, rice vinegar, mirin, barley malt, and the juices of yuzu and sudachi. Yuzu is Japanese for citron, a yellow thick skinned fruit (Citrus medica) that resembles a lime or lemon but is larger and not as acidic. It grows in semitropical climates and originated in China. Sudachi is another Japanese citrus fruit thought to be a cross between Chinese lemon and a citron. It has the appearance of a small lime, and is native to the Tokushima Ken area of Shikoku, one of the southern Japanese islands. EDEN Ponzu Sauce contains no artificial coloring agents or flavorings, chemical additives or preservatives. 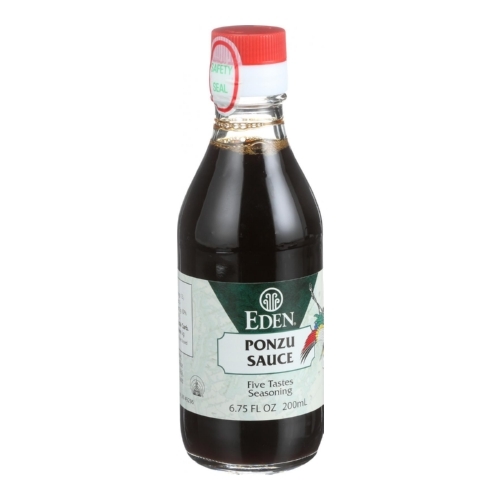 EDEN Ponzu sauce is made without oil and has about one tenth the calories of French dressing. It adds volumes of flavor yet zero fat. EDEN Ponzu Sauce is convenient, quick and easy to use. Frequently used as a dipping sauce for vegetables cooked in an earthenware bowl called do-nabe. Today it is used in a variety of ways for dipping noodles, cooked vegetables, tofu and fish. It can also be used as a salad dressing as a an ingredient in salad dressings. The unique combination of ingredients in EDEN Ponzu Sauce gives it a distinctive salty, sour, mildly sweet, and slightly pungent flavor. We love it on the table and in the kitchen. Ingredients: Serving Size: 1 Tbsp (15 mL) Amount Per Serving % Daily Value� Calories 5 Calories from Fat 0 Total Fat 0 g 0%Sodium 340 mg 14%Potassium 15 mg 0%Total Carbohydrate 1 g 0%Protein 0 g 0%�Percent Daily Values are based on a 2,000 calorie diet. Ingredients: Shoyu (Water, Soybeans, Wheat, Sea Salt), Rice Vinegar, Mirin (Water, Rice, Koji, Sea Salt), Barley Malt, Yuzu and Sudachi Citrus Juices.